Enterprises are turning to Salesforce’s cloud-based business solutions to reduce operating costs and gain the IT agility that can drive engagement and increase growth, retention, and efficiency. Salesforce’s suite of cloud-based applications enable the world’s most forward-thinking brands to stay on the cutting edge of business innovation using cloud, mobile, social, and data analytics. As a strategic partner of Salesforce, our deep platform expertise - from engagement strategy to custom web and mobile applications - is unparalleled. Since 2004, we have worked in close collaboration with Salesforce, serving clients internationally across every industry. 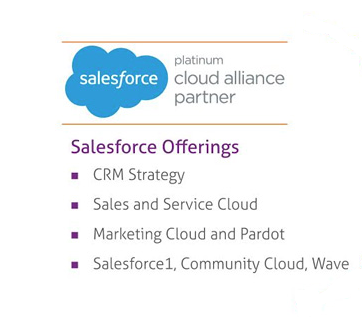 We are known as strategic innovators, implementing cutting-edge and award-winning solutions on the Salesforce platform. Our salesforce services and Salesforce consulting services team is led by certified experts using an innovative solution framework and proprietary accelerators to reduce overall implementation costs and help our customers get the most out of their Salesforce investment.